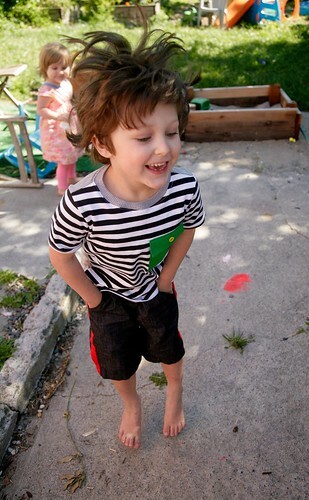 I hope all of you who were participating in Kids' Clothes Week had a fantastically productive week. I have enjoyed seeing all of your great makes on your blogs. I was sewing along with y'all, but I did things a bit differently this time around, and didn't even try to blog any of my makes during the week. With a full time job and a busy schedule, KCW can sometimes feel a bit stressful. This time around, I tried to take things easy - I made just one outfit for each of my kids (I started Joe's last Saturday) and besides some Instagramming (yes, I'm on Instagram finally! ), I focused my energy on sewing rather than photographing or writing. I also totally disregarded the theme, even though this season's theme "Wild Things" was really fun. Instead, I focused on items I had the supplies for and had been wanting to sew for a while. Photograph on the left copyright Celina Bailey and used with permission. First up, a sewing blog knockoff! A couple weeks I posted about my Joe and Maggie Pinterest Boards. While most of the pinning was done by me, I did share the boards with the kiddos as well. Joe especially has strong ideas about what fabrics, colors and styles he likes best (t-shirts and shorts being a given). In looking through the board I put together for him, he took a strong liking to the image above on the left of a blue striped tee with a bright green pocket and black trousers with a narrow pink stripe. First up, the shirt. This is almost exactly like Celina's shirt, with the only difference being that my shirt has black stripes whereas hers had blue. Joe would have preferred blue stripes, but I wanted to work with materials I have, and I had this Riley Blake stripe left over from Joe's Log Triangle Shirt. I used Rae's Flashback Skinny Tee in size 5 with generous seam allowances and a little extra length (Joe is about to size out of the smaller range of this pattern!). Knits can be a "win some, lose some" endeavor, with some items turning out inexplicably better than others, and I'm really especially pleased with how nicely finished this shirt looks. I must say, these Riley Blake jerseys do curl a lot (like the Kaufman Laguna jerseys as well), but press and sew nicely and have a lovely quality feeling to them. 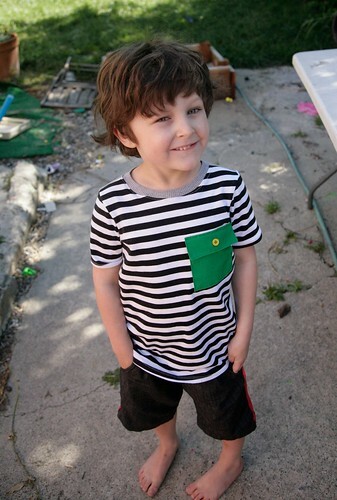 I used bright green quilting cotton from my stash to make the pocket. 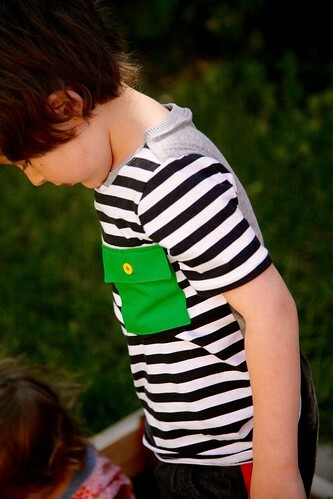 I actually used the breast pocket piece from the Sketchbook Shirt to make the pocket, and then drafted a little "flap," applying it just like the cargo pockets on the Field Trip Cargos (it's true what they say about oliver + s patterns providing a sewing education!). If you do this at home, don't forget to put your buttonhole in the flap before you sew it on! Just as in the original, the back of the shirt is a contrast gray (I used some cheap gray jersey I have had in my stash for a long time) and I used gray ribbing (harvested from an old tank top) for the neckline. Since sewing up the Grainline in a plaid fabric, I feel like I'm finally getting the hang of pattern matching. These sleeves aren't perfect but they're pretty good! One of the best parts of having a sewing blog is creating a record and being able to see your slow improvements over time. The best part is that Joe really likes his new shirt, and Maggie liked it so much she has already put in an order for "one with a pink pocket"! Luckily I still have more black striped fabric! Oh right, I was distracted there. The shorts! These are exciting for two reasons: (1) They are made from a woven material! Joe has worn almost solely knit fabrics for over a year. (2) Joe likes them anyway! WAHOO! The secret is the soft fabric (not stiff at all) and a knit waistband. Aha! This is life-changing, people. As much as I enjoy sewing with knits, I have bridled under Joe's restrictive requirements for the past year ... I want more variety! So this is great news. For these, I used a super-soft black chambray shirting fabric that has been in my stash since ... OMG, talk about a walk down memory lane, 2011! There's nothing stiff or scratchy about this stuff, and it drapes really nicely. I'm pretty sure I got it at Britex, they have the most beautiful shirtings. Joe really liked the vertical stripe on the original pinned pair, and on our computer screen it read "red" rather than the "hot pink" Celina said it was in her blog post, so we went with red. 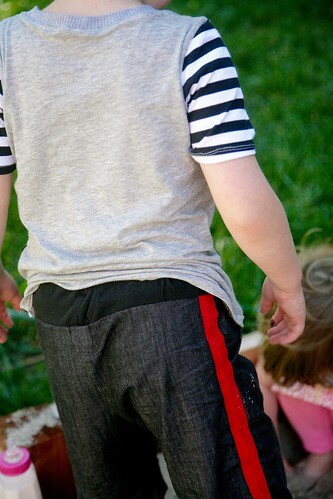 For the stripe, I used some red double fold bias tape I had the in the stash and ironed it flat into single fold and applied it to the side of the shorts before sewing up the inseam and crotch. The pattern, of course, is the Sketchbook Shorts, one of my most sewn patterns of all time, I think, in size 5. Besides the stripe on the side, the changes I made to the pattern included scooping the pockets lower (I've always found the hand openings to be a tad too small on this pattern) and cutting the waistband in soft lycra jersey, and a little bit wider than the original pattern waistband piece. Then I used wider elastic which I secured to the side seams so it doesn't roll. 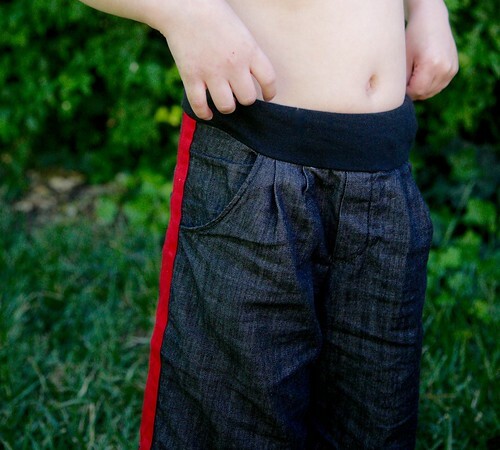 I sewed the elastic into a loop, placed it inside the waistband loop, and serged it right onto the shorts. Then I pressed the waist seam allowance down and sewed a soft ribbon tag in the back to help Joe figure out which way is which and hopefully cover up that slightly rough spot where the serged waist seam meets the center back seam. These remind me a little bit of maternity shorts, but Joe likes them and finds them comfortable! And I'm just THRILLED to be able to make him some shorts (mostly) in non-jersey fabric! Ah, the simple things in life, right? Maybe he'll start wearing pants again at some point? Let's not get ahead of ourselves, shall we? Joe says, "No, I like shorts." For my part, I've already cut him out another pair of Sketchbook Shorts, this time color blocked, in a very soft linen. Fingers crossed! A huge thank you to Celina Bailey of Petit a Petit + family for providing such great inspiration, for being flattered rather than annoyed at my blatant copying, and for graciously allowing me to borrow her photograph for this blog! Joe and I are so pleased with his new outfit! What a great outfit! 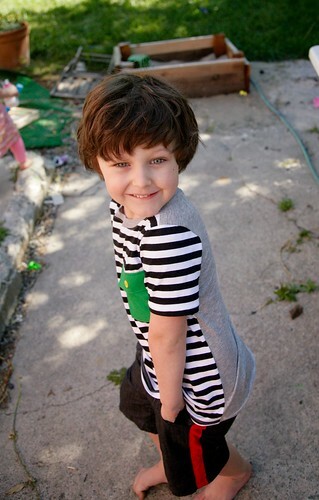 Also, Joe is such a handsome little boy - those eyes, that hair! He is going to be a heartbreaker. I haven't pulled the trigger on the Sketchbook yet but I really love your shorts with the mods. AH you totally nailed it! Love the shirt AND shorts (i agree about the sketchbook shorts pockets being small btw). Joe looks awesome. You nailed it for sure! I love this outfit! Joe looks so cool! ;). You recreated it beautifully.and with a dress for Maggie too, you hit it out of the park this KCW! Yay!! So good to see he's got his wearing mum-made cool stuff mojo back. Knit waistbands rock and we're blogging twins today in that regard. He is looking beautiful in these pics, shaggy hair and pretty eyes and all. Such a beautiful boy. Yes, introduce him to super soft linen. I know I find it as comfy as knit. Definitely nailed it! A knit waistband is a fab idea, I bet it is super comfy. That is a super cool outfit-- I may have to copy it for one of my guys! 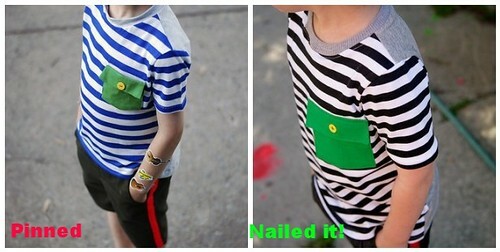 I am always scared to sew pockets onto t-shirts for some reason but this makes me want to give it a shot. 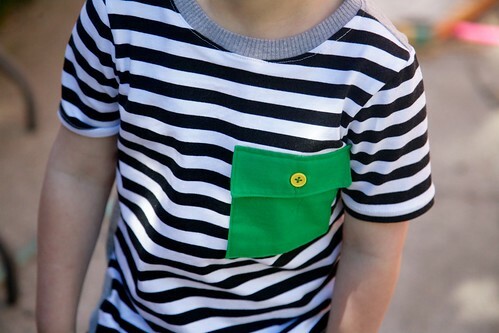 That pop of green is so good against the stripes. Hooray that Joe likes his non-knit shorts!! I hope he likes the linen version, too. You more-than-nailed this! A very smart, very comfy outfit. Joe has good taste - great outfit! 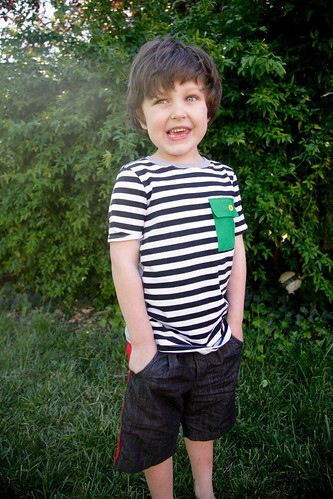 I'm with you - blogging and participating in Kids Clothes Week is too hard! There are only so many hours in the day....off to find you on Instagram! Love everything you made! Fantastic! Fabulous outfit, Inder! I love everything about it.